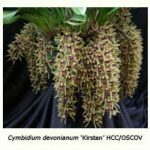 This attractive small-flowered cymbidium species is found in northern India where, together with several other cymbidium and coelogyne species, it grows in old, mature and often rotten trees that are frequently laden with leaf litter and moss. The sub-temperate zone in which it occurs lies at an altitude of 1800 -2700 m.
Cymbidium devonianum was first discovered by John Gibson whilst collecting for the sixth Duke of Devonshire (known as the Batchelor Duke), and was recorded in cultivation as early as 1837. It has also been rediscovered more recently (1978) in northern Thailand. Joseph Paxton, a prominent horticulturalist and superintendent of the Duke’s estates, named it after his employer. 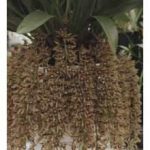 Paxton noted that it needed to be planted higher in its pot than other cymbidium species, as its flower spikes frequently emerge horizontally, or even grow downwards from the base of the pseudo-bulbs from which they emerge. 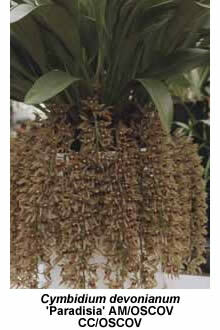 Cymbidium devonianum differs from most other cymbidium species in its growth habit. The mature pseudo-bulbs are 15-30 mm wide and a little taller. Each pseudo-bulb carries between two and six leaves. Each leaf has a stem (petiole) with a narrow groove that runs well into the leaf, which is approximately 35 cm long and 8 cm wide. The new growths, both leaves and flower spikes are blackish purple in colour. Leaf tip burn is a common problem with this species, particularly if the water supply contains any salt. Minimal use of fertiliser is recommended to alleviate this problem. Flower spikes normally carry from 15 to 35 evenly distributed flowers, each about 25 mm across and a little taller. The sepals are elongated ovals that reflex and sometimes twist, while the petals are smaller and diamond-shaped. Flower colour varies from light yellow-green to dark green, overlaid with purple-red spots and stripes. The column is pale green (occasionally red at the tip), while the pollen cap is a contrasting white. The spade-shaped lip is white, with red spots and bears two dark purple-red spots at its widest point. Whilst Cymbidium devonianum sets seed readily in the wild, its pollinator is unknown. It’s been said that this is because no one has ever been willing to stay in the jungle overnight to find out! The glossy black seed capsules are about 30 mm long and 15 mm in diameter. A cool grower, Cymbidium devonianum appreciates frequent and heavy watering in summer and should not be allowed to become too dry in winter, as this may lead to flower spikes that are shorter than normal. 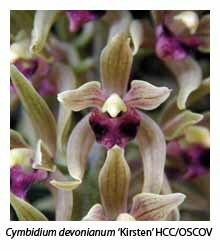 It prefers lower light levels than other cymbidiums. 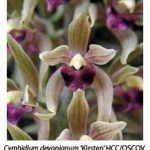 Although Cymbidium devonianum was first used as a parent in 1911 to produce C. Langleyense (C. devonianum x C lowianum), its use in hybridising did not become popular until the 1970s, when 13 hybrids were made. A further 28 hybrids were made in the 1980s, 67 in the 1990s and 120 since then. 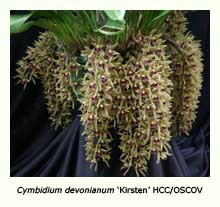 Over a hundred of these hybrids were made using Cymbidium devonianum as the pod parent. The most striking features of these hybrids are the patterns or veins on their broad lips, as exemplified by C. Jack Hudlow ‘San Gabriel Branch’ (C. High Sierra x C. devonianum). An exception is C. (Olive Street x Davidia) ‘Mystique’, which has a pure lime-green flower with a snow-white lip.